Arbeia was built when the Romans retreated back to Hadrian’s Wall from the short-lived Antonine Wall in Scotland around AD 160. 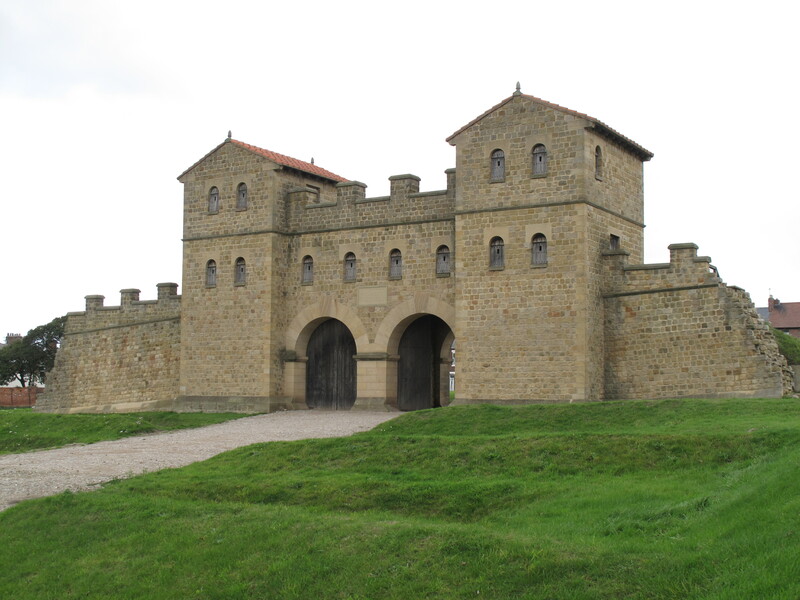 The fort was renovated several times over the centuries and barracks were converted into granaries as the fort became a supply depot in the early third century when Emperor Septimius Severus took his turn campaigning in Scotland. In the late third or early fourth century, the Tigris Bargemen (numerus barcariorum Tirgrisiensium) from the eastern Mediterranean arrived at the fort for duty as the garrison unit. They are believed to be the ones who gave the fort the name of Arbeia, or ‘the place of the Arabs’, and they remained in charge of the fort until the Romans withdrew from Britannia at the beginning of the fifth century. Foundations of granaries, gates, headquarters and commandant’s house. Reconstructions including a full size West Gate, which stands at a height of 25 feet. At ground level there are two archways, the middle story is enclosed with windows and the top level is an open walkway. Another reconstruction is the Commandant’s House built in the Mediterranean Courtyard style with a frescoed courtyard at the centre of the house. The other side of the building has barrack rooms displaying soldiers’ quarters with lumpy beds and earthen floors. Arbeia’s museum houses several funerary altars with inscriptions that tell us a lot about the people from near and far who lived in and around Arbeia. All content copyright of Margo Malcolm and Roman Footprints, 2018.